For the past year I’ve been performing Strava data gymnastics looking into GPS head units people have been using across a multitude of events. This has quickly developed into an overall statistical snapshot of any event uploaded to the platform. From Ride London, to Boston and London Marathons, through to the Ironman 70.3 World Championships in Chattanooga. I can’t quite explain my fascination with the data, but since others have found it interesting, I’m continuing to run with it…. so to speak. 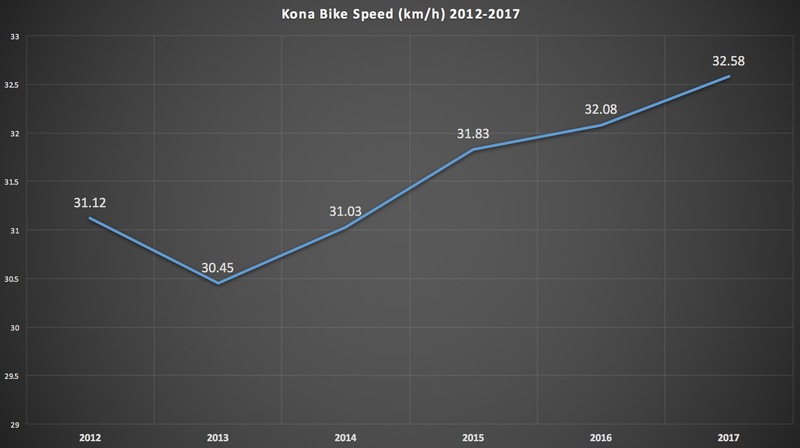 The annual Kona bike count has become a very popular reference point to analyze trends and see what the professional and top level age groupers are using for the Super Bowl of swim, bike, run. 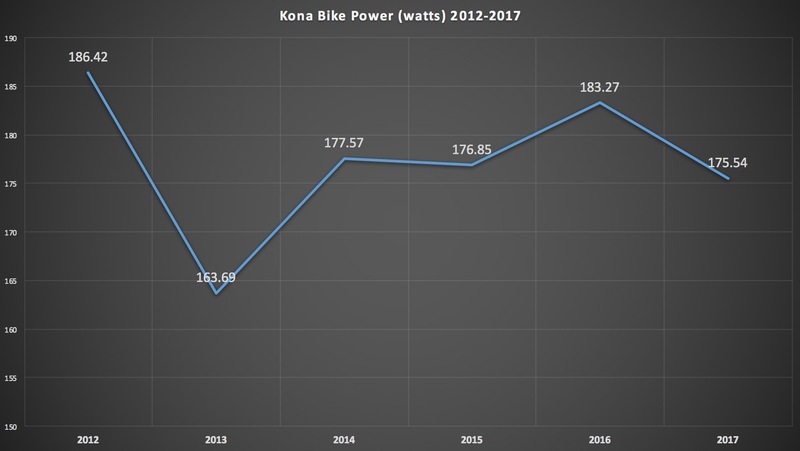 These bike (and now full equipment) counts are the tireless work of a few eagle-eyed and very dedicated individuals who spend a number of hours recording and collating what’s on show at Kona on the Big Island of Hawaii. This is without a doubt one of the most comprehensive accurate equipment reporting I know of across any top level sport. Let’s be honest, Ironman isn’t just a ‘bat and ball’ sport, there’s a lot of equipment involved. The only limiting factor with the bike/equipment count is it only covers “what they have”. Sport is rarely about what you have, it’s all about what you DO. Getting the “what they do” data is a little harder. Thanks to Strava, we can now put our finger pretty closely on the pulse, literally, of Kona athletes. “If it’s not on Strava it didn’t happen” – An often heard quip in cycling that has spread across almost any sport that can be uploaded and tracked on the platform. 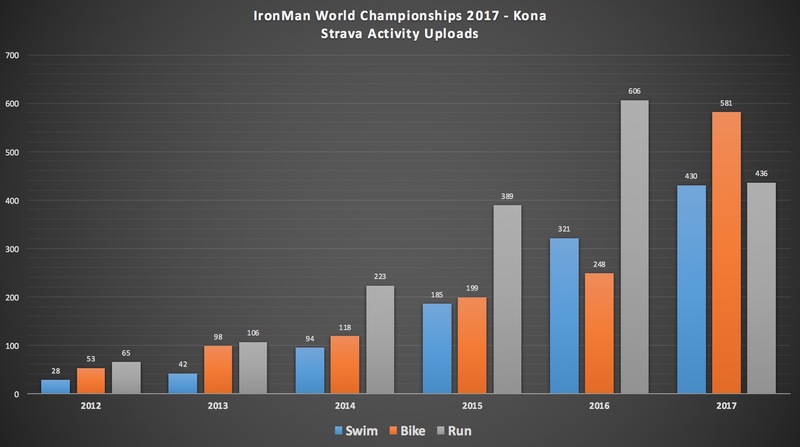 So while not everyone uploads everything to Strava, and with some athletes choosing to keep their activities private, there is a growing trend in recent years for Ironman athletes at Kona to upload their activities to have their epic feats of endurance on show forevermore. Well, that is assuming Strava stays around that long. 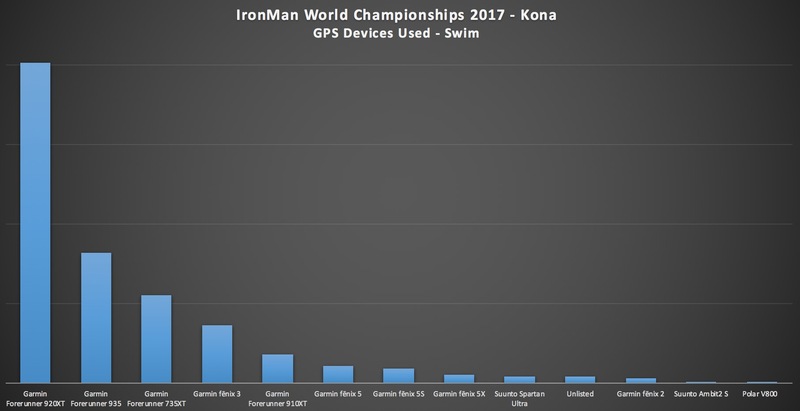 Given the 2017 Championships were only a few days ago, the statistics here will be likely missing a handful of athletes still searching for a wifi hot-spot to upload. Maybe they’re still out celebrating. Having said that, we’ve still have a pretty solid sample set to look into. This data has been sourced from publicly accessible Strava activities. Data anomalies have been corrected/removed where possible (no, you didn’t ride 9,970km in the bike… and no, you didn’t do 414W for 180km). Athletes can choose to keep their gender private, so the totals will be different to the Male + Female + Total numbers. This data will also differ slightly in ‘what they have’ compared to the actual equipment counts. It’s highly likely athletes with all the gadgets (power meters) are more likely to upload to Strava than those who don’t. Otherwise, on with the show! Right… with that out of the way, hopefully this is what you’re here for. It’s probably somewhat unsurprising that the number of bike uploads is the highest across all three sports, given that Strava started off with cycling being its primary sport. Next, let’s take a look at the average paces, heart rates, power numbers, and even speeds of athletes. Again, keep in mind that the gender-specified numbers are only if the individual specified their gender on Strava. I thought it was interesting how very close the men’s and women’s average heart rates were for the run, that’s kinda cool – despite being 26 seconds/kilometer difference in pace. And in the case of cycling, the two heart rates were identical. Of course, power numbers would vary, and since we don’t know the weights of everyone on Strava (it’s not a supported parameter), there’s no way to do watts/kilogram. A pretty even distribution over the entire time plot, with what is likely some pros on the left side, and then you see the rush of everyone else after that point. Ahh yes, what you’ve been looking for – the breakout of devices used! It’s like the Kona Bike Count Power Meters breakouts, but for watches and related. Here’s the raw data. Again, remember this is only for people that uploaded. You could roughly multiply this times four to get the actual ballpark numbers (assuming trends stayed constant, and they largely appeared to throughout the 3 days since the race concluded). Next, let’s break-down what devices people used depending on how fast they were going. What’s interesting here is actually looking at the slower run times and noticing there aren’t any devices that have lesser battery life claims – such as a FR230/235 or a FR735XT. Whereas you do see those devices in the faster groups. Obviously, this is likely because those devices would die well before the athlete got to the run (unless they wore it only for the run). But it’s neat to see the data basically support that. Note: 4 Min/KM pace = 4:00-4:59, etc. Some records omitted with no pace data recorded. A look back from 2012-2017 at some of the statistics. The catch here is that 2012-2014 were pretty thin on data points compared to 2015-2017. Still, I think they’re worth including since we’ve got the data at hand. A decrease in 2017!? That’s not what the bike count said! Remember, this is Strava activity uploads. There’s a number of forces at play. 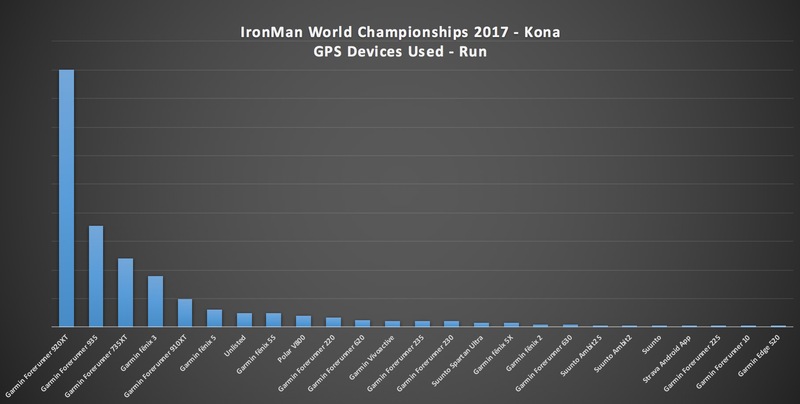 This is the data on Strava as of a few days post Kona 2017. To get angry at it would be like yelling at a (the) cloud. Power down and speed up in 2017… Possibly an indication that aerodynamics is an area a lot of competitors are focusing on? Rightly so if that is the case. 180km is a long time to spend in the wind. Alternatively, shifts in winds compared to last year could also account for this too. 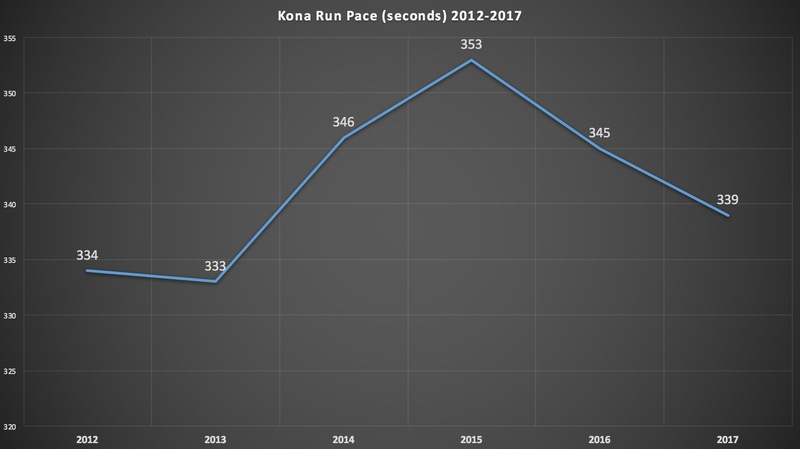 And you definitely saw a faster run course this year than last year on average. 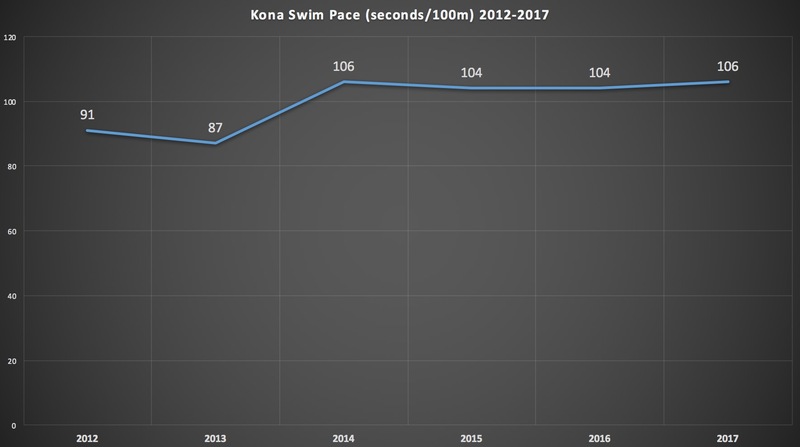 Again, factors like weather are likely at play here, but keep in mind that the entire field at Kona pretty much rotates through each year with new qualifiers (except the pros), so you aren’t really looking at the same set of people each year. 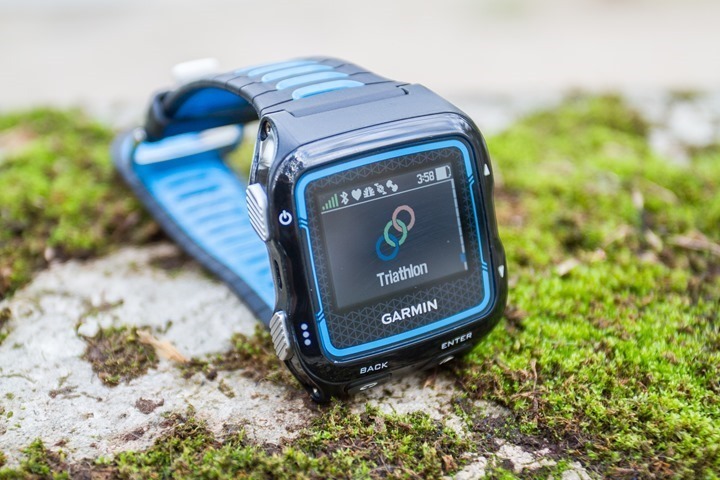 The Garmin Forerunner 920XT was a stand out device across every leg. It held off the Edge 520 (The current King/Queen of road cycling) and the relatively new kid on the block, the Forerunner 935. 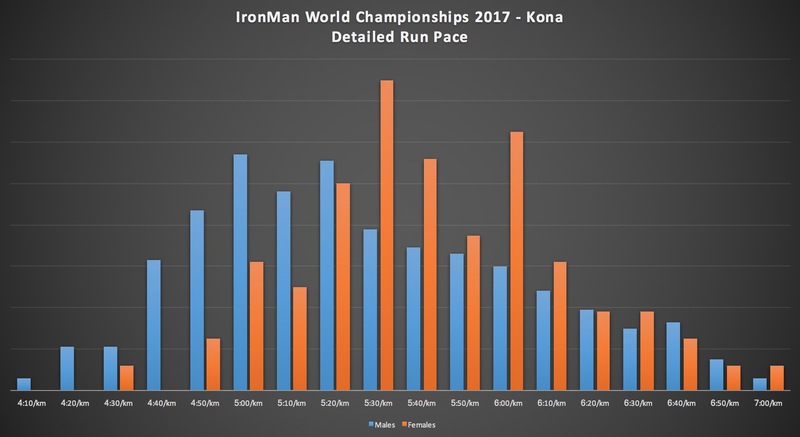 It was also good to get an insight on just how fast the ‘average’ Kona athlete is across all three disciplines. Kudos to you all! I hope you’ve found this as interesting as I have while diving into this data. Huge thanks to Ray for the opportunity to share this data to DCR Readers! From DCR: Hope everyone enjoyed – and thanks for sharing the data Shane, definitely cool stuff! Thanks for reading! Husband. Internetworking security. Cyclist. Traveller. Bone breaker. Zwift. Strava. YouTube. Always moving. Can’t fathom someone *actually* using an Edge 25 for this kind of event – but there you have it, someone did. One. Poor soul. I was more impressed that one of the fastest runners was using an original Vivoactive! 2.5 years old. Still wearing mine, love the slim form factor. Of course, I’m not even considering Kona. I would be curious if you can include the percentages of people using Stryd running power meter? Would also be curious if you could compare by AG the average run pace with Stryd vs w/o. Similarly the bike avg speed w and w/o power meter. 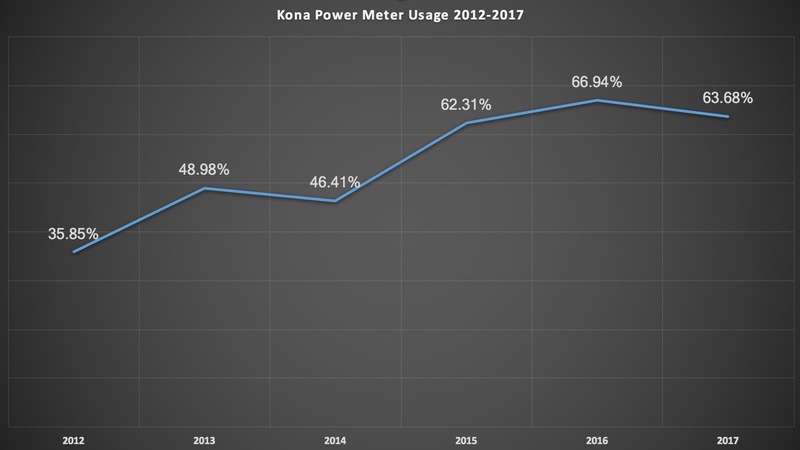 Are people using power meter equipment performing better? A) If you use Stryd in regular CIQ data field mode where you’re in the ‘Run’ sport, then the data doesn’t actually appear on Strava, or at least isn’t pullable problematically. B) If you use Stryd in the older-school mode where it sends power as a power meter to the ‘Cycling’ app/sport on the Garmin, then it does show up on Strava…but that’s a bike activity by default, so you have to change it to Run. We didn’t have one of these people/activities handy to dig into more deeply to figure out how to grab that data. I also suspect most people fall into Camp A above. Note, Stryd says approximately 150 people used devices at Kona. I have no reason to doubt them, they’ve always had a good presence there. *On Garmin devices of course, but since only 4 people were on Suunto devices out of the sample set, it’s trickier. Happy days! Here’s hoping this brings us one step closer to a GPL/DCR podcast. Wait, what? Somebody ran with an Edge 520? At 4:00 pace? I could totally see myself doing that. Here’s how it probably went down: They were on the bike, and their wearable’s battery died. Realizing this, they actually had enough smarts to end the bike segment upon completion of the bike, and then re-start a new activity in T2. Later on they’d just change the ‘activity type’ to run. Again, kudos to them for thinking outside the box. Or, perhaps they just forget their watch on another continent. I like to think that they had the watch quick release on and they popped their bike computer to their wrist. Good old reliable 910XT, missing just Glonass and HRM-Tri options,but having bike profiles. And thanks Ray for the pace/speed analysis. Just the curiosity, what the athletes think, they gained the higher avg speed? Is it their condition, increased FTP or is it bike-tech (low friction, aero bikes) or environmental factors? Shane did all the work! He’s also sleeping right now (or, I hope so, it’s 2:20AM for him). But, my suspicion is on changes to wind. perhaps someone with knowledge of the winds over the last few years of race days would have some insight. Certainly one can lookup weather station data, but knowing how that played out in terms of exact times and positions on the course is really something that any competitor there would probably instantly remember. Would the normalized power for such a race be quite off (higher) from the average power (as it is quite hilly, windy etc)? Not a special part for Pros in the article (as there is a pro option on Strava) ? It would be interesting to compare the Strava distributions to the true distributions you probably could get from the IM results page. Of course you can’t do that for power/HR but you could do it for the swim/bike/run paces. Wish the usage of the 920 would convince Garmin to bring the form factor back! I’m just not a fan of the round ones. I’ll get over it, I know. Did anyone else notice that Patrick Lange did not have any device (at least visible on the wrists) at the finish? I wonder if this will motivate Garmin to bring back a square watch at a cheaper price point. The used markets for 920s are still solid. Personally I went for a 920XT Tri bundle (HRM-Swim +HRM-Tri HRMs)! On CleverTraining list price 349 USD, which was 332 EUR. Postage fees from USA to EU 22 EUR and import tax or EU customs fee (call it as you wish) 57 EUR. So, overall it costed 411 EUR. In 2009, the 310 with Premium HRM 320 EUR. In 2012, the 910XT with HRM 390 EUR. Fwiw, no dependency or even looking at the official results page. All data straight from Strava. 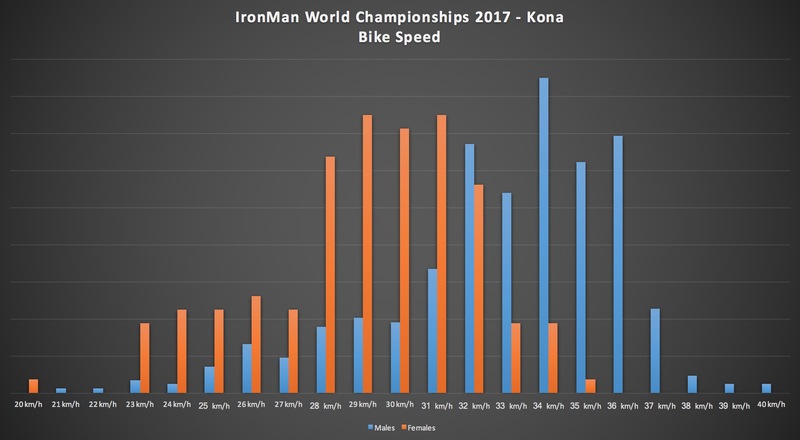 Looks like most men that qualify to Kona swim 1:22 100yd pace, bike 21 mph, and run an 8 min/mile. Not positive about that run pace… seems fast? Funny. I was going to say that the run pace seems by far the slowest of those three, but I guess that just shows that I’m a runner. Shane, you ever tried out tableau for this kind of stuff? Think you’d love it….. I haven’t. Just checked it out. Niiiiiiice! I keep things pretty raw for the most part. My stats output is in a terminal window… which I personally love. The graphs are a necessity for easier consumption. Being a data geek and in healthcare, but without a big budget, I have been playing around with R and more recently Python with Pandas/Numpy. This post makes me want to look more into the Strava API and curious about further categorization of the data by age group and gender (for average speeds/power). Any chance you and Ray are able to attach the data in csv for the other budding data scientists? And/or perhaps a guest post on accessing/using the available APIs for Strava or tools for individual fit-file analysis would be cool! Thanks again for the interesting analysis! Now if were to run a regression analysis of the weight of the watch onto the pace of the run, you would see why people wearing a Forerunner 920XT were so much faster than those with a Fenix 5X. Or why my 5X and I are that much slower. 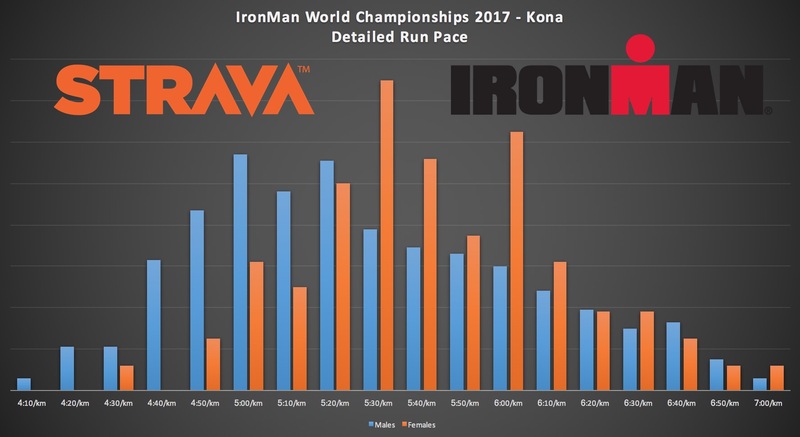 I remember in the comments of the 935 review someone calculated the time difference between the heavy Fenix 5 and 935 as over 2 full seconds for the full iron man because of the weight difference. Unfortunately I bought the 935 and am still rediculously slow 🙁 but I love the watch. I think that might have been me. I also calculated I’d save 4 secs by using the aero Elemnt Bolt. In the end when I did my first IronMan in Aug both those benefits were cancelled out by walking bloated and sick for 10k on the run ? haha. Thank you Ray and Shane for your work, nice data, presentation and videos, very much appreciated! Please let there be more competition like in the power meter market that is just a joy to any potential consumers. PS: I second that Raymaker-GPLama Podcast idea !! Does anyone find it curious that historically the run has had the most activity uploads, but in 2017 it was far outpaced by bike uploads and nearly matched by the swim? One reaching hypothesis: more competitors are using tri devices, whose batteries don’t end up making it to the end of the event? Thanks DCR and especially Lama for all the interesting data! Any idea what power meters were in use and what the preferred power meter was ? It’d be interesting to see this data on all these city races where the average runner is dominate. Wonder what the device use looks like. It’s interesting to see regional differences there too. Usually the Forerunner 235 “wins” in running races I recall but, as here, Garmins everywhere and only the Strava app really spoils the party. LAVA Magazine’s component count listed 1418 power meters, so at the moment the Strava upload rate is only 41%, even generously assuming that all Strava bike uploads came with actual power numbers. Also, Edge etc. counts (vs. Fenix/FR) for the bike leg may be lower than actual, due to Strava’s duplicate workout suppression. I wonder if there is a way to see who used multiple units and how that effects the overall data. I track a full race on my Fenix 3 but use an Edge 520 on the bike because it’s easier to read. I then delete the extra activity later. I would expect the number of 910XT uploads to increase over the next week or so. It’s such a pain to upload stuff from it. What you mean by pain to upload from 910XT? At work I have the Garmin Express installed and paired with both the 920XT and the 910XT. At home I am using ANT+ Agent with Tanita and 910XT and upload takes a few seconds. At Garmin Connect I do not have Tapiriik installed, so I manually upload selected activities to Strava. That process takes seconds too. Strava is then synchronized with Relieve. I think he’s referring to the fact that some people may not travel with a laptop/desktop, and thus with the FR910XT there is no offloading to a mobile phone. As such, those people wouldn’t have access to offload until they got home. For example, The Girl has a laptop, but she doesn’t always bring it on trips. If she still had a FR910XT, then, she’d have to wait till she got home. Do you think they will learn from this and build a ‘real’ upgrade of the 920xt? I’m curious how you came to that conclusion? Most people seem pretty darn happy with the FR935. You wouldn’t have the entire field buy new watches in the last 5 months (since the FR935 came out then). Yeah I now much prefer my FR935 over my now essentially retired FR920XT. That said nothing wrong at all with the FR920XT and for most use cases there is no real “need” to have a newer watch as it won’t make you go any faster! Bike power is interesting. It would be good to know actual w/kg. But if you a rough estimate that the average weight of male competitors is 70kg than that gives you about 2.6w/kg, which if you the flip it around for the women gives you 55kg which again probably isn’t far off the mark. Probably not unreasonable to guesstimate that both men and women averaged around 2.5-2.7w/kg for the bike ride. Astonishing the extent to which a single company dominates these markets. The age groupers and amateurs go where the elites go (generally), so someone has to be feeling pretty good right now. There is also the question of where else would you go for this sort of watch. I guess the reason for a lot more bike uploads than run or swim could be the device. The Bike segment has a lot of the Garmin Edge being used – devices largely for cycling use. 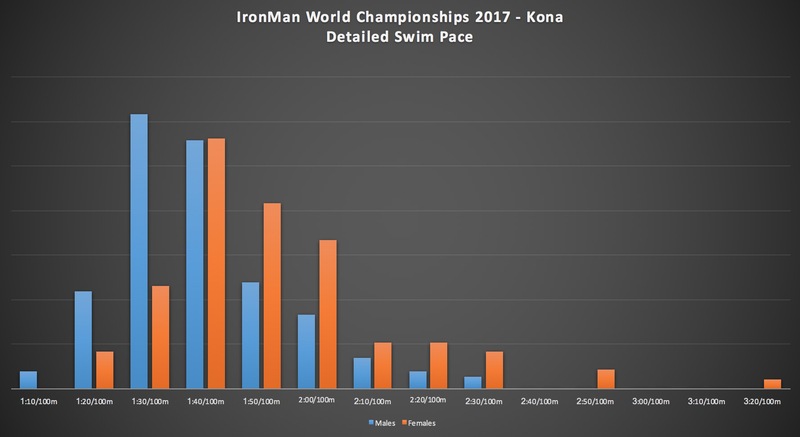 I have been arguing with a lot of my friend also that athletes participating in ironman are mostly cyclists who take on the swim and run leg, the %age of runners who take up cycling and swimming is lower and the swimmers who take up cycling and running very little. And if my above conclusion on the data upload / device used is anything to go by then my this theory has some basis. Very Nice analysis. Thanks for writing. Fenix 5, 5x, 5s are shown separatedly, while I cant see none of Fenix 3 HR. Does Fenix 3 include F3HR or there was none?